The Fireface UFX+ becomes the centre of any multi-track studio, with the ability to handle up to 94 channels I/O with ease. Unprecedented flexibility, compatibility, the inclusion of DURec (Direct USB Recording) and RME's famous low latency hardware and driver designs - the Fireface UFX+ raises the bar to new heights. The new Fireface UFX+ is packed with features not found on its older sibling, including MADI I/O, taking it to 188 channels of I/O (128 channels more than the Fireface UFX), a more powerful DSP, USB 3.0, Thunderbolt, and a new optional remote control. 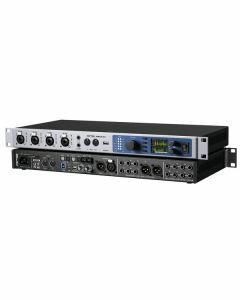 This firmly places the RME Fireface UFX+ as the new reference in multitrack recording, mixing and monitoring. Its flexibility in connectivity and expansion is unrivalled - Analogue, ADAT, MADI, AES, SPDIF. USB 2, USB 3 and Thunderbolt are standard on the Fireface UFX+. The UFX+ has an impressive channel count: 12 analog + 16 ADAT + 2 AES + 64 MADI = 94 channels input plus output = 188 channels in total. Thunderbolt gives the Fireface UFX+ real PCI Express audio performance under Mac and Windows, with lowest latency, lowest system overhead and lowest CPU load. The Fireface UFX+ is fully Thunderbolt compatible under Windows, including hot-plugging. All new AD/DA converters, optimized analog I/O circuits, as well as improved SNR and THD values guarantee pristine, crystal clear and transparent audio. A new PADfree mic circuit design with +18 dBu maximum input level and 75 dB gain range serves even the most critical recording situation and source trouble-free. The Fireface UFX+ opens the doors to a host of RME and 3rd party digital and analog I/O solutions. Expanding your analog channel count, the ability to route/mix within the digital domain through numerous sources presents many flexible options. Several external MADI devices can also be connected in series. To further enhance MADI flexibility, the Fireface UFX+ boasts some typical RME-style features. For example in USB 2 mode, which is limited to 30 channels I/O (12 analogue plus 16 ADAT plus AES), the MADI I/O is still available via RME's integrated hardware mixer TotalMix FX. Word Clock I/O (BNC) can be switched to MADI I/O (coaxial), and a special split mode even supports the use of both MADI I/O's simultaneously, with 32 channel each on optical and coaxial. The optional Advanced Remote Control USB connects directly to the Fireface UFX+ or any computer giving you tactile TotalMix FX control.